Grantland’s complete reaction to last night’s Grammy Awards is forthcoming later today, but for now, below, here’s a partial list of the winners. 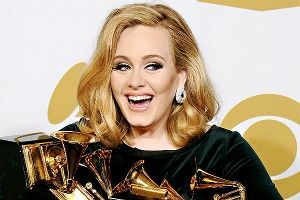 As you may have heard, Adele dominated, both through her widely praised performance of “Rolling in the Deep” and through her uncanny ability to mind-meld her name into basically every envelope that was opened. The other story of the night was, of course, the tributes to Whitney Houston, most notably Jennifer Hudson’s rendition of “I Will Always Love You.” But if there’s one other thing that people will be talking about, it’s Justin Vernon’s acceptance speech. Reaction was swift, and predictable. Despite Vernon’s crossover groundwork on Kanye’s My Beautiful Dark Twisted Fantasy, a whole lot of people had no idea who this dude was. Also, a whole lot of people thought his name was Bonny Bear. Which, like, side project! Comedy Album: Hilarious, Louis C.K.